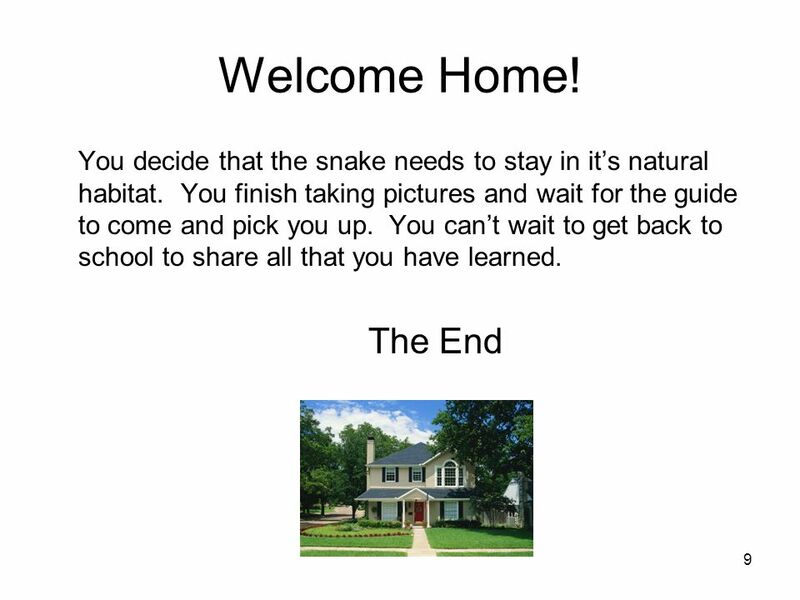 1 Teacher Directions Step One: Students should type their story, including the choices, using the Inspiration organizer. Remind students to include titles. 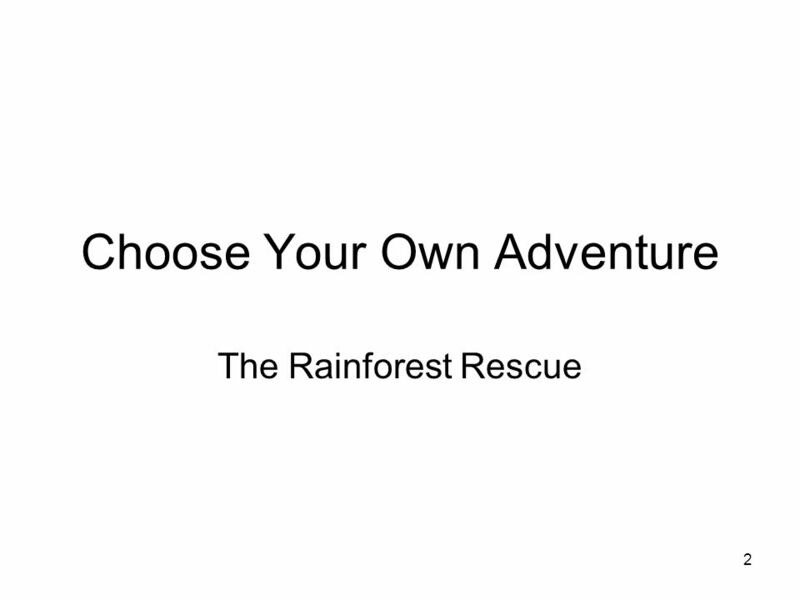 2 1 Teacher Directions Step One: Students should type their story, including the choices, using the Inspiration organizer. Remind students to include titles for each page, as this will make it easier to set up the action buttons. Each section should represent a slide in the Power Point program. You may want to consider using this as a partner activity. 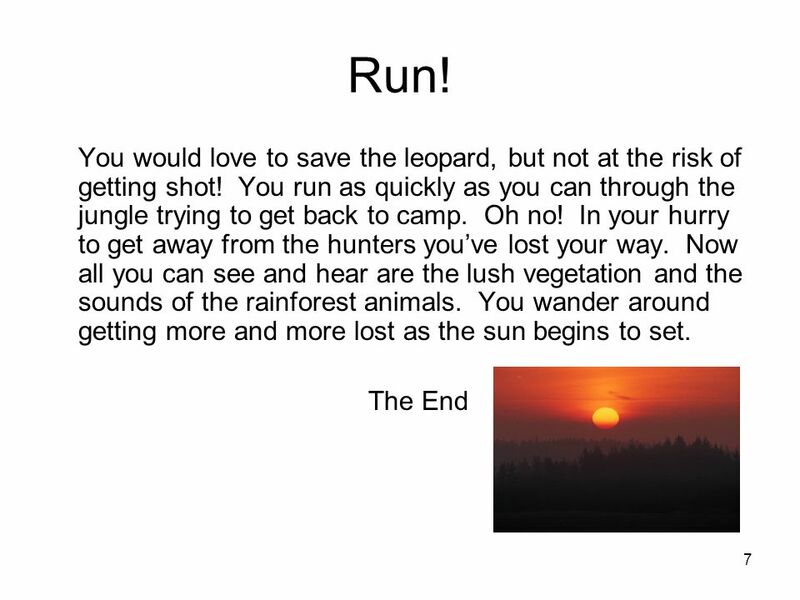 Step Two: After the story is finished, students can add the action buttons next to the choice. Follow the directions below to add an action button: Go to Slide Show on the toolbar Select Action Buttons and click the type of button On the Action Settings menu click on the circle next to Hyperlink to… On the dropdown menu, scroll down to Slides Select which slide the button should take you to Continue for each choice in the story. 4 3 Away We Go! Your class has raised money to buy land in the rainforest, preserving the abundance of plants and animals that thrive in the jungle. 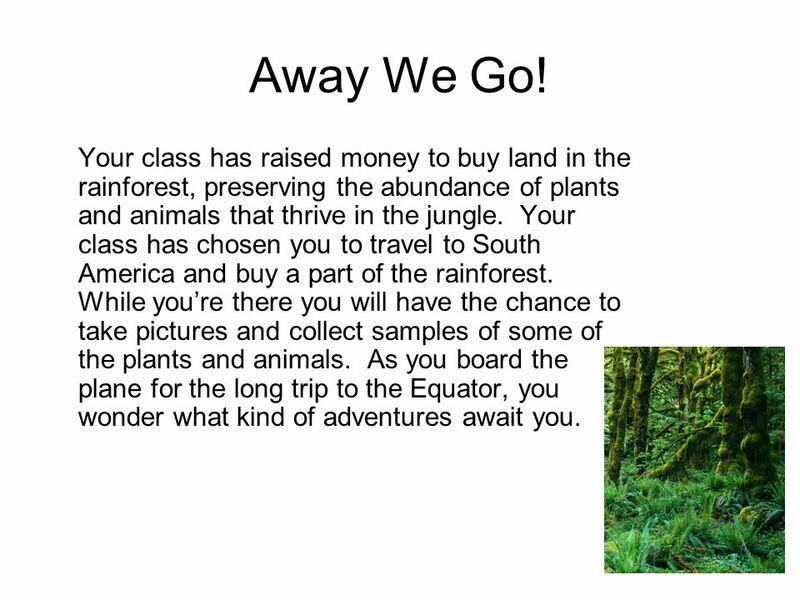 Your class has chosen you to travel to South America and buy a part of the rainforest. While youre there you will have the chance to take pictures and collect samples of some of the plants and animals. As you board the plane for the long trip to the Equator, you wonder what kind of adventures await you. 5 4 Save Me! As you step off the plane into the hot steamy climate of the rainforest, your guide takes you to a jeep that leads you deeper into the rainforest. As you drive you notice the variety of plants and animals. Finally you reach your campsite. Your guide wishes you luck, but cautions you not to venture far from the campsite and disappears into the jungle. Its time to get to work. As you begin collecting samples of plants and taking pictures of the different animals you hear a piercing scream. It sounds like someone or something is in trouble. 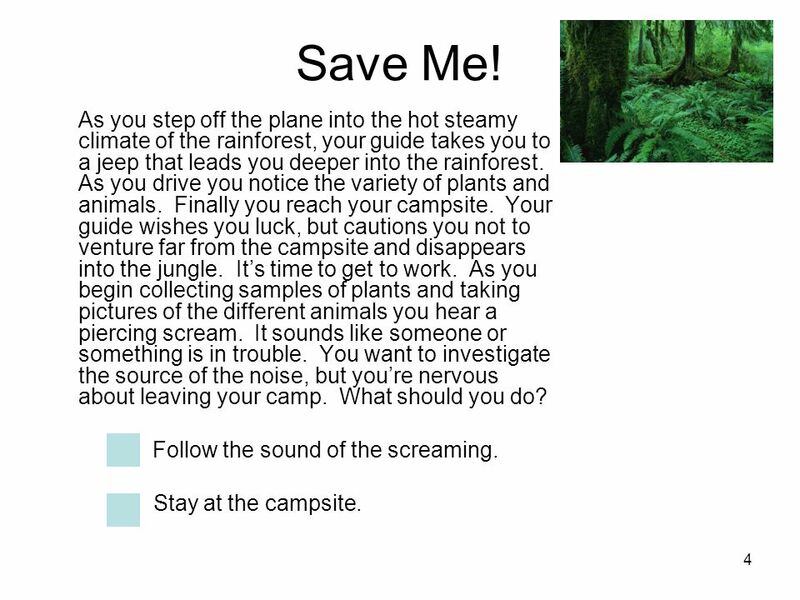 You want to investigate the source of the noise, but youre nervous about leaving your camp. What should you do? Follow the sound of the screaming. Stay at the campsite. 6 5 Leopard Rescue You have to help whoever is making that awful screaming noise, so you run into the thick jungle. You come to where you think the noise is coming from and you stop short when you spot a leopard with its paw caught in a trap. The trap must have been set by hunters. You are staring at the leopard and wondering what to do when you hear voices. It must be the hunters! 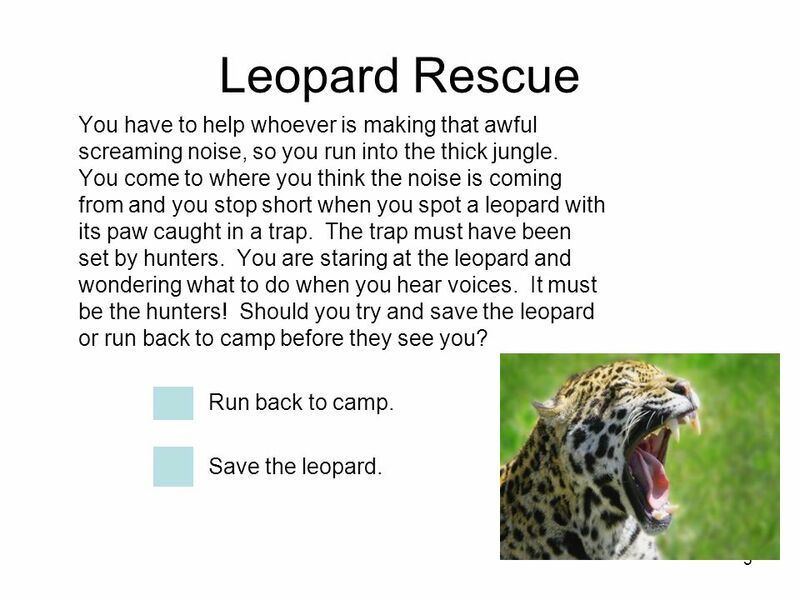 Should you try and save the leopard or run back to camp before they see you? Run back to camp. 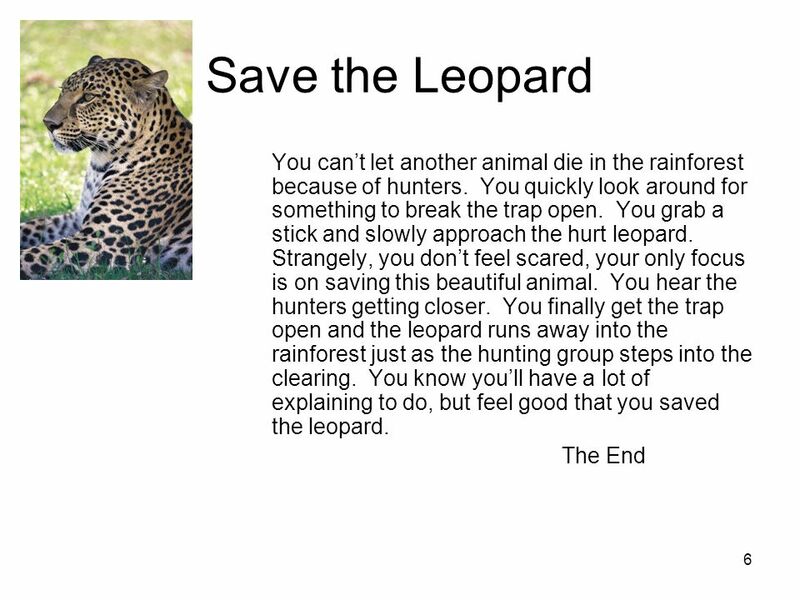 Save the leopard. 9 8 Play It Safe Your guide told you not to leave the campsite and besides, it was probably just a howler monkey. You continue searching for different plants to show your classmates when you suddenly freeze. Next to your leg is a huge snake and it is looking right at you. 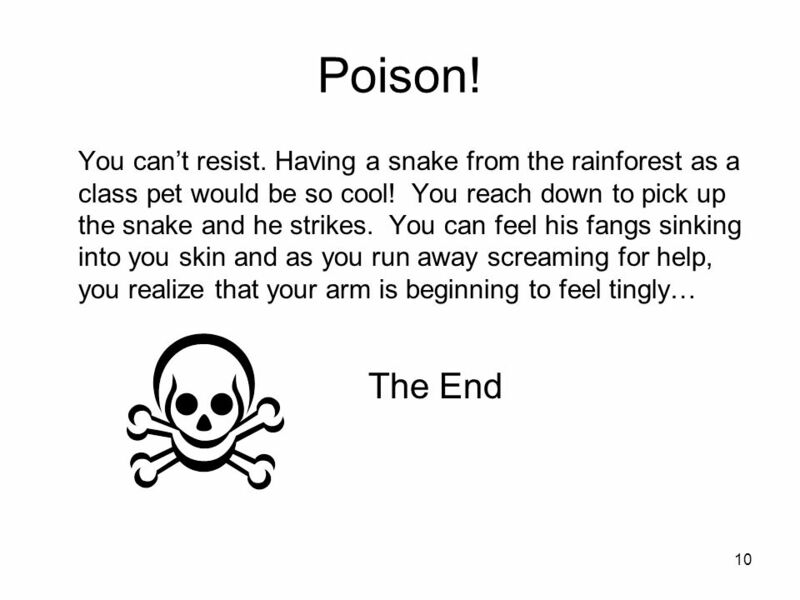 You remember reading about various snakes that live in the rainforest, especially the ones that can paralyze your nerves with one bite. Wow! Would the kids in your class love to have this as a pet. 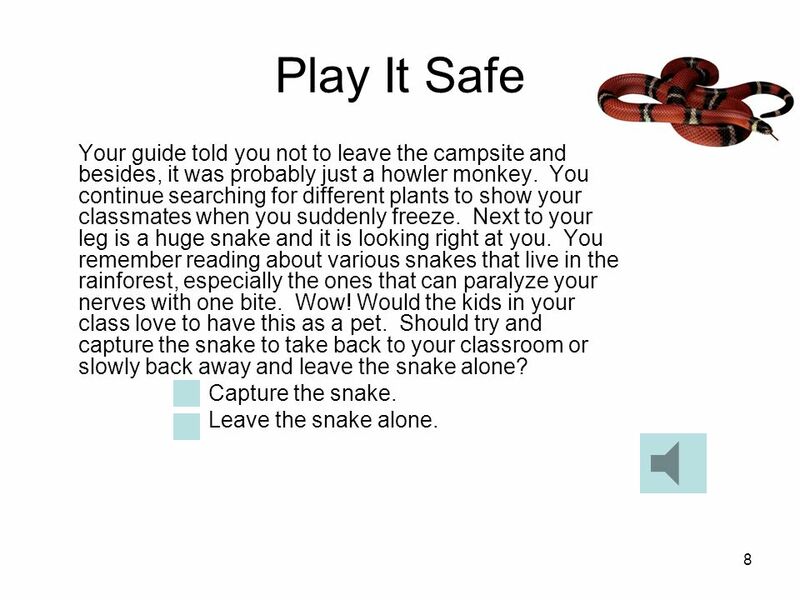 Should try and capture the snake to take back to your classroom or slowly back away and leave the snake alone? Capture the snake. Leave the snake alone. 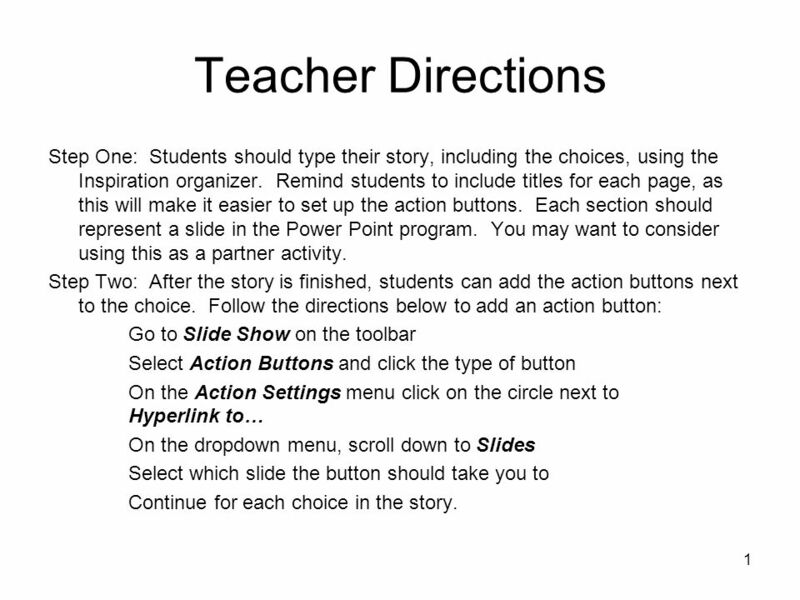 Download ppt "1 Teacher Directions Step One: Students should type their story, including the choices, using the Inspiration organizer. Remind students to include titles." Unit 5 It must belong to Carla Section B Period 1. By: Lea Andrew Alyssa Alexxys. You are an advanced scientist. Your friend, Ryan made a time- machine after you heard about a secret message, about what. Going Home Three boys and three girls were going to Florida. When they got on the bus, they were dreaming of golden beaches and the blue sea as the great. Your worst Nightmare !!!!!!!!!!!!!!!!!! By Abby-Louise and Frances. A fairground adventure WARNING! Have you ever read a story where you and you alone are in charge of what happens? No you say! Well now you are about to. RICHARD THE BRAVE By Leonardo Cazanas Royo PAGE #1 You are an English citizen of Liverpool. Your name is Richard and you are a well known hunter in the. My First Story written and illustrated by Tanya Anderson Click here to continue. Peer Editing DO NOT pick up a computer Pick up a “Peer Edit with Perfection” note-catcher from the plant counter Have a pen or pencil ready to take notes. Juan’s Journey Unit 2 Week 1 Inside Out. You have just landed in Hollywood. You want to go meet Nicole Gervais, the famous actress, but you have to check in the “Grand Hotel” by noon. You really. MOUNTAIN CLIMBING MAYHEM BY: PAYTON HENGGELER. You go on a hiking trip with some of your best friends. When going up the mountain you feel great. As you. “Time to go!” Grandpa Joe yelled. “Okay grandpa!” Mason and Amy yelled at grandpa. “I can’t wait to go to Canada, the country filled of beautiful plants. Antarctic Adventure By: Andrew, Dan, and Nicolai. The Epic Adventures ofYou!! !The Epic Adventures ofYou!! !The Epic Adventures ofYou!! !The Epic Adventures ofYou!!! By: Amanda And Nadia.  Click the arrow to begin. Welcome to the tropical rainforest, I’m your tour guide Tony! You never know what you might find out here, so let’s begin.